As I said in the previous post Christopher Carter was the innkeeper of the Three Swans inn on Stony Stratford’s High Street. He had been there since 1705. He claimed in the letter of 1726 that his business misfortunes arose from the demolition of part of his building 12 years earlier and a failure to make it new. It is hard to estimate at this distance in time how much of Christopher Carter’s business losses were due to this factor or his own mismanagement. Anyway, by 1730, Christopher Carter was facing insolvency and was unable to pay his rent. The letter I reproduce below is from Thomas Chapman, who I take to be a Stony Stratford solicitor, to the Trustees. He comes across as a reluctant advocate and is not terribly sympathetic to Christopher Carter. 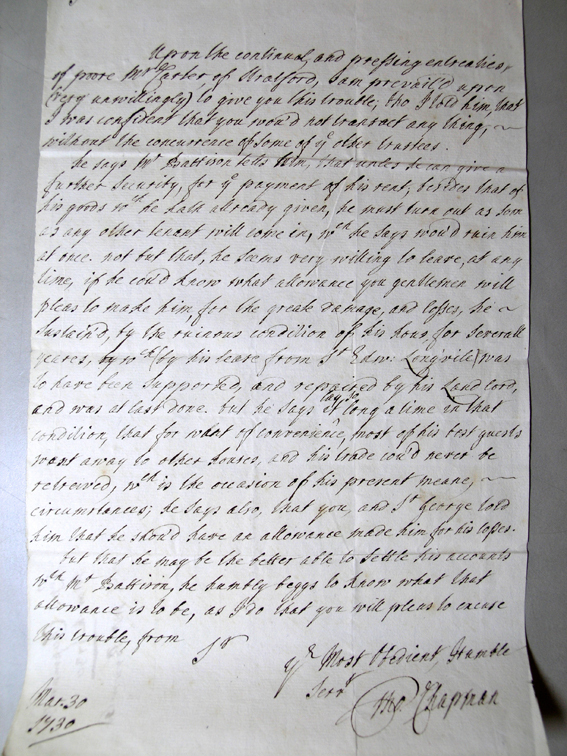 The letter to William Bromley, one of the original trustees and dated March 30th 1730, is transcribed below. 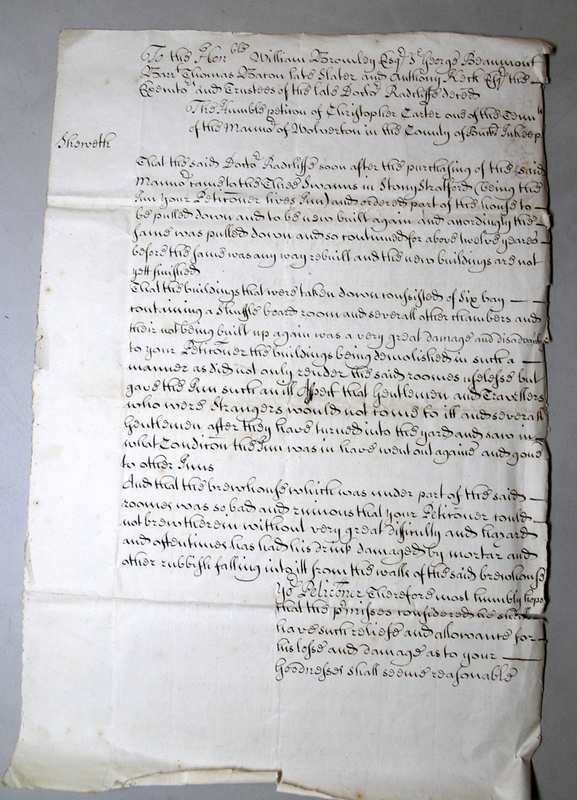 Upon the continued and pressing entreaties of poore Mr. Carter of Stratford, I am prevailed upon (very unwillingly) to give you this trouble, tho I told him, that I am confident that you would not transact anything without the concurrence of some of the other trustees. The outcome was that the Trustees did give the man relief from his debts and immediately took on another tenant – R. Wilmer in 1730. The tone of the letter is interesting. Chapman is doing his duty by his client (who is presumably paying him for the letter) but he is clearly anxious not to offend anyone as mighty as as Radcliffe Trustee. The Three Swans would have been caught up in the great fire of 1742 and was presumably rebuilt. It stayed in business until about 1785 when it was converted into a residence. Christopher Carter was the innkeeper of the Three Swans in the early part of the 18th century. The Wolverton Estate owned and leased several of the major inns on the Wolverton side of Stony Stratford – The Bull, The Red Lyon, The Three Swans – and two smaller ones – The Queen’s Head and the Nag’s Head. Of those the Three Swans was considered the premier inn. It was located on the site now occupied by 92-94 High Street. In 1726 Christopher Carter was not a happy man. Part of his inn was falling into disrepair and despite promises made to him 12 years earlier the work had not been remedied. According to his account, which I will print below, Dr. Radcliffe visited the inn and ordered that a dilapidated part of the building be torn down so that it could be replaced by a new building. One assumes that this was in 1713, just after Radcliffe had made his purchase and one might guess that there was a certain amount of persuasion by Carter that this work, probably neglected by the hard up Sir Edward Longueville, was essential. However Dr. Radcliffe died the following year and this may have left Carter in limbo. His Trustees needed time to organise and familiarise themselves with the manor and establish priorities. Since they only met twice a year on the average it was probably difficult to get decisions in those early years. Christopher Carter may have been living in misguided hope. Eventually, after 12 years he submitted this petition to the Trustees which was, to judge by the neatness of the script and the language, drawn up by a lawyer. The Trustees were minded to listen and allowed him some relief on his rent. It was probably too late to revive his fortunes because in 1730 he was facing insolvency. That the said Doctor Radcliffe soon after the purchasing of the said manor came to the Three Swans in Stony Stratford (being the Inn your petitioner lives inn) and ordered part of his house to be pulled down and to be new built again and accordingly the same was pulled down and continued for about twelve yeares before the same was rebuilt and the new buildings are not yet finished. That the buildings that were taken down consisted of six bay containing a shuffleboard room and severall other chambers and their not being built up again was a very great damage and disadvantage to your petitioner the buildings being demolished in such a manner as did not only render the said roomes useless but gave the inn such an ill report that Gentlemen and Travellers who were Strangers would not come to itt and severall Gentlemen after they had turned into the yard and saw in what condition the inn was in have went out again and gone to other Inns. And that the brewhouse which was under part of the said roomes was so bad and ruinous that your Petitioner could not brew therein without great difficulty and hazard and oftentimes had his drink damaged by mortar and other rubbish falling into it from the walls of the said brewhouse. Your Petitioner therefore humbly hopes that the promisses considered he shall have such whose and allowances for his loss and damage as to your Goodnesses shall seem reasonable. One can easily imagine the reaction of customers who found clumps of mortar in their ale.